You can distress painted furniture using Vaseline. This is a step by step tutorial with photos. Step 1. Paint furniture desired color using paint of choice. Step 2. When paint is dry wipe Vaseline lightly over selected areas of the painted surface. Step 3. Brush on second coat of paint in a contrasting color to first layer. Step 4. Let dry then immediately wipe off top layer of paint with a rag. Each step in the technique for Vaseline distressed furniture is explained in depth below. This is the cedar chest after it was painted, distressed, and stenciled. I paid $15.00 for the cedar chest with broken top. The JTS made the repairs for me. I could see potential in the cedar chest despite the flaws. I didn’t have the perfect paint color on hand and I combined several colors from my paint stash to get this beautiful blue. I hate to go and buy more paint if I can work with what I have on hand. The technique of using Vaseline (petroleum jelly) as a paint resist has been around for a while. I’ve used this process numerous times with beautiful results. I rubbed a little Vaseline on the cedar chest in strategic areas after the coat of turquoise paint was dry. I wore gloves so my hands wouldn’t be icky, and I didn’t put the Vaseline on thick or all over the cedar chest, just little swipes here and there. I used a can of oops paint from Wal-Mart for the top coat. This paint has been sitting on my shelf for over a year. It’s a beautiful Cherry Red and I fell in love with it at first sight. Just haven’t had the perfect project until now. After I rubbed the chest down with Vaseline (sounds a little strange when I put it that way), I put a coat of the Cherry Red on the bottom of the chest. The top I intended to leave turquoise, no red topcoat. When the red paint was dry I took a damp rag and wiped it down. The areas where the Vaseline was applied rubbed off pretty easily. At this point I decided to go ahead and put Vaseline on the top and then paint it red too. 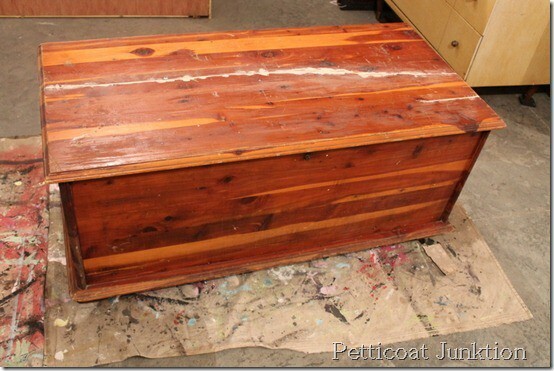 I wasn’t loving the contrast between the top and the body of the cedar chest. It’s okay to change furniture makeover plans mid-stream. I do it all the time. If the plan isn’t working, move on. I went through the same process with the top…..damp rag…..rub all over…..paint comes off. I use a damp rag instead of sandpaper because I don’t want the scratched paint look. Next for the “over the top” touch, a Martha Stewart stencil from Michaels. I used the same turquoise paint for the stencil. I didn’t want a perfect look so I did a few off center curlicues at the bottom of the design and then I took a sanding block and lightly sanded the whole chest, stencil included, just very lightly so the paint wouldn’t look scratched. To protect the finish and for a little extra pow, I applied two coats of Minwax Poly Acrylic Latex Gloss Sealer. The turquoise and red really pop against each other. The turquoise doesn’t show as well in the photos. It’s a little more vibrant than its showing here. I applaud your courage on this project! i almost cried when i saw the BEFORE pic…that cedar was SOO BEAUTIFUL! I was so sure I would only hate whatever you did to it. Turns out I do not know my own mind. The new look is great. 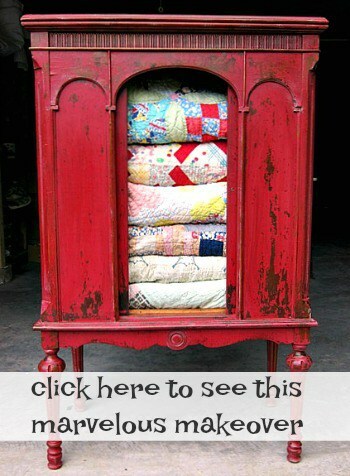 I am so gonna try that look… I have an old trunk that needs some lovin’! Thanks for opening my eyes … My goal is to rescue stuff from the dump..so I must learn that my personal prejudices about wood need to take a back seat! I know what you mean about painting some wood furniture. There are some things I will not paint. I also wish you and every one else could see the piece in person. Those photos are horrible. I’ve worked on my photography skills and have improved since those photos were taken. I still have a long way to go. Good luck with your trunk. Thanks for sharing this technique! I have done some chalk painting…..I can’t wait to try the Vaseline method. Also, luv the color combination. Another idea I heard was to use a dark pink 1st coat with a red 2nd coat, then distress it with the dark pink showing through. Awesome. I want to try both these! Thx. Keep those creative ideas coming! Thanks David. That color combo sounds fun. Someone also suggested gray and pink combo! I am currently doing a refurbishing project with the Behr latex paint, and I want to try the Vaseline technique. I am curious, however, when it comes to wiping off the Vaseline, if one uses a damp cloth, would the latex paint (the paint that one wants to stay on their project) not wipe off due to it being water-soluble? Carmen, You don’t wipe the Vaseline off. Brush on your first layer of paint…let it dry….wipe on the Vaseline….heavily….paint on your second color….let dry….rub the top layer off with a damp cloth or wet cloth depending on how easily the paint rubs off. Hope this helps. Great tutorial! I’m a beginner and this was very helpful. I bought my first small project yesterday and I’m wondering if you can use this process with chalk paint? I don’t think I would try the process with chalk paint. 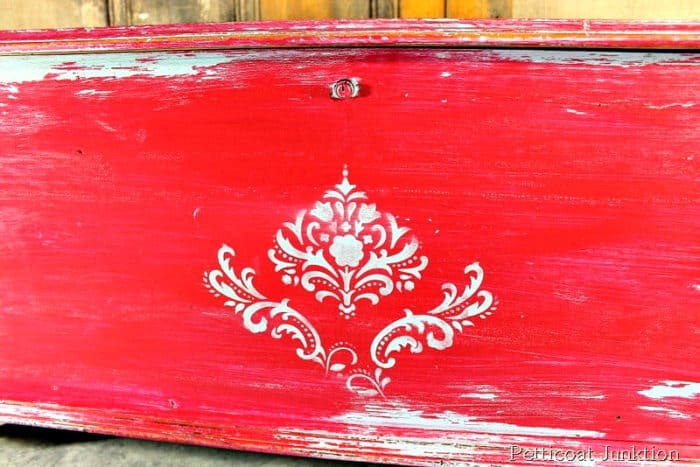 Chalk paint really grabs on to wax or anything applied to it. I would be afraid the vaseline would soak into the chalk paint and you wouldn’t get the same effect. But I could be wrong. Maybe try this on a sample board with the chalk paint and the Vaseline. Hope this helps! Ive been thinking about trying this technique and was happy to see it used with the same colors i will be using on an old sewing machine table I purchased for just $7 (minus the sewing machine). With any luck mine will turn out just as nicely. I’m in the process of painting a wooden ottoman and found your technique of using Vaseline to distress the color a bit; I can’t wait for the first coat to dry!!! I’m a bit confused. Did you put the thin layer all over the piece or certain places where u wanted to rub & distress? Enjoy reading all your posts! Thx for the inspiration! Thank you Paula. I love my readers! I wouldn’t be here if it wasn’t for you guys. I put the Vaseline on willy nilly where I thought I wanted the piece to be distressed. I’m getting ready to do a piece maybe in January and try something a little different. Love this look. You’ve inspired me. I’m sitting here trying to figure out which piece of furniture I can try this on! Definitely adding this to my list of things to try! This seems much easier than sanding to get the distressed look. Thank you for sharing! I have an old metal milk jug that I want to try this on. I want it to be a deep brick red with hints of turquoise throughout. Great post! That would look awesome…now I have to look for a milk jug! Do you have to sand down the dresser before you apply the paint? I never sand before painting if I can help it!! 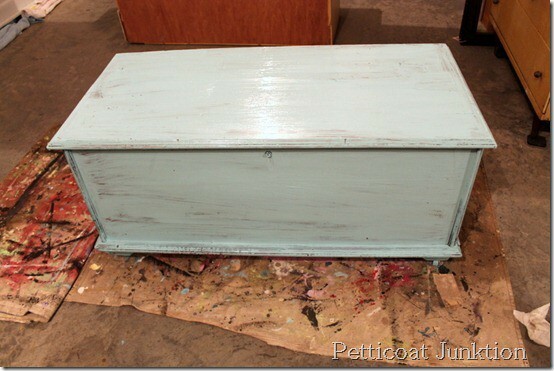 I wanted to use the milk paint, two colors, and have the bottom color show through. I was going to use one of the wax pucks for coving some of the dried lavender paint (1st coat) and then paint over that with the linen paint. I’ve gone through your videos and I don’t see a video of the process I want to use. I’m a newbie at this so need some technical help. Sent you an email Sue. 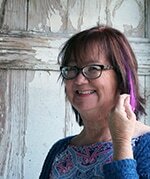 Miss Mustard Seed has a wax puck tutorial on her site. I live on Vancouver Island. Recently took a class on chalk paint and have done a few small projects. Will give the vaseline a try. Do you prefer latex to chalk paint? I’ve been researching distressed painting. I have purchased several pieces for my bedroom and am eager to get started but feeling a bit intimidated by all the different processes/paints available. (Oil vs. latex, chalk vs. milk, sanding vs. not sanding, etc.) I love the idea of using vaseline as opposed to candle wax. Thank-you for sharing! Thanks for the tip; really enjoyed learning this stuff!! Awesome!!! 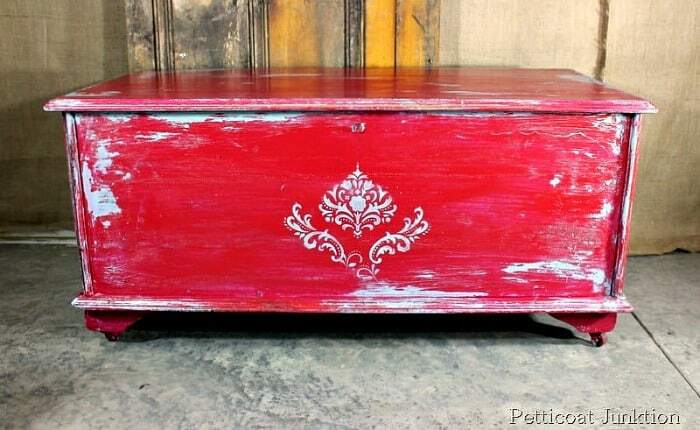 Hi Kathy, Love the look of this chest! It turned out fabulous. 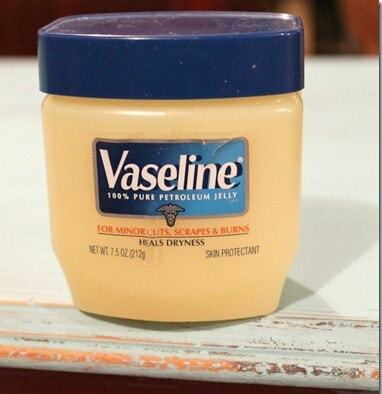 I have used the vaseline tech too…..it’s a great look. Love your site and following. LOVE LOVE LOVE THIS TRUCK! I have one that I white washed but it isn’t near as cool as the red color….maybe it needs updating?!?!? I pinned this so I can use it as a guide! I will be hosting a blog hop on Monday at http://www.frugalfitfamily.com and the link is up so if you get a chance…stop by and join in! Hi, fellow MMS retailer, great tutorial!! It would be awesome if you would join my first link party this weekend with this project! thanks for the party invite, I’ll hop right over! It’s so charming and pretty, and I love the two colors together. I love your creative process. Thanks Sue, I love the two colors together. I have to admit I wouldn’t have paired them together if I didn’t have inspiration from other places. I have never tried vaseline to distress, but you’ve inspired me to give it a try! I would not have thought the colors would work together; the chest is lovely. It colors are so pretty and the stencil was just what it needed! Good job, Kathy! Kathy, This is an awesome looking re-do and I really appreciate the tutorial, I was wondering if you sealed it with anything when you were done painting?. Thanks! you know, I did seal it and I forgot to put that on the post. thanks for asking. I put on two coats of minwax polyacrylic latex gloss. I’ve been pretty absent, lately, due to our moving process…but, just had to pin this one and comment that I love it! 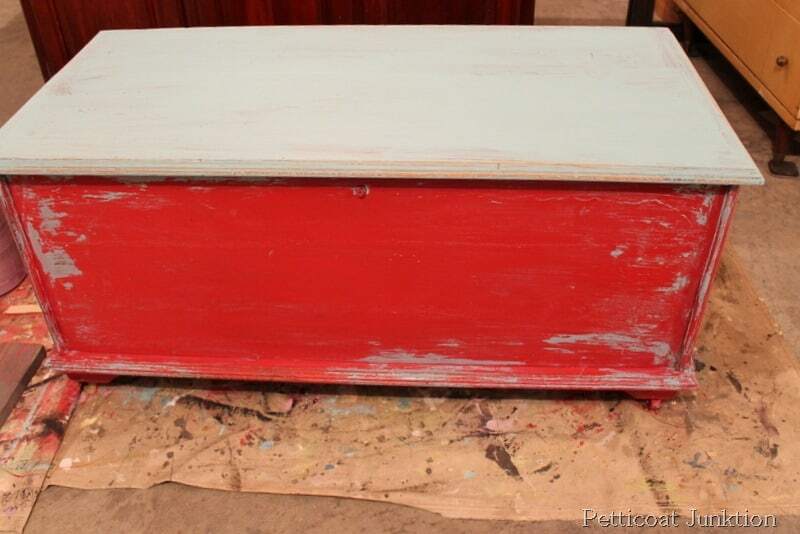 I have a cedar chest that I painted many years ago, white with a floral design and it has been waiting for me to repair and re-do it. I can’t wait to get re-settled and transform it again! Thank you for sharing your wonderful project! Beautiful! I love this color and the transformation is amazing! Have a great night my friend.